In a major boost for skills and employment in the Richmond Park community, 120 people have graduated with new skills as part of The Richmond Park Treasury Trust skills development programme. Atterbury Property Holdings has developed a R6.2 million landmark pedestrian bridge between Lynnwood Bridge Retail and Office Park with Glenfair Boulevard in Pretoria. 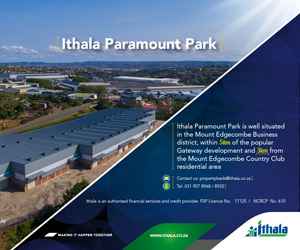 Residents of the Limpopo town of Bela-Bela (formerly Warmbaths) will get a whole new shopping experience with the opening of Atterbury Property Developments' new R220 million Bela Mall on 23 October 2014.